This property is approved for one dog with an extra security deposit. Occupants agree to be fully liable for any damages and injuries caused by any animals found on the premises. Any additional animals found on the property will be presumed to be strays and removed by the appropriate agency as prescribed by law. 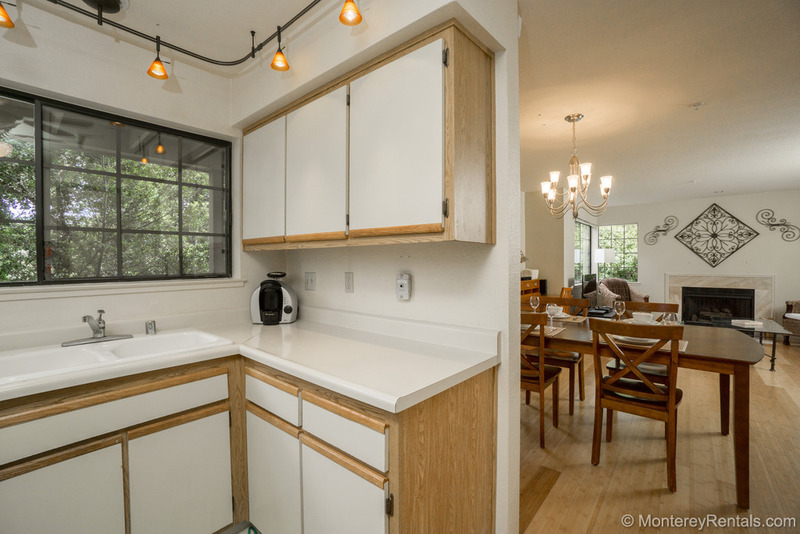 Nestled into a hillside, this lower level condo is accessed by two sets of exterior stairs. The living room has a futon sofa, a gas fireplace, a flat screen TV and a desk. The Master bedroom has a Queen bed and a private bath with a tub/shower, the second guest room has twin beds, and there’s a hall bath with a corner shower. A deck off the dining room has views of the oaks (expect some traffic noise). The condo has a covered carport and one additional assigned parking space. The Oaks condo complex has walking trails, a tennis/basketball court, a clubhouse, a hot tub, a pool, and easy highway access, whether you are visiting or working in the Monterey area. Washer/dryer inside the unit. One small dog (under 40 lbs.) allowed with extra security deposit.